From January through December, let's take a look at what Pennsylvania has to offer this year. Pennsylvania’s angling opportunities are many. Panfish, walleyes, trout, muskies, both smallmouth and largemouth bass, catfish, on and on — our diverse habitats provide a perfect landscape for a wide variety of options. Here’s where to find some of the best action and when to find it. 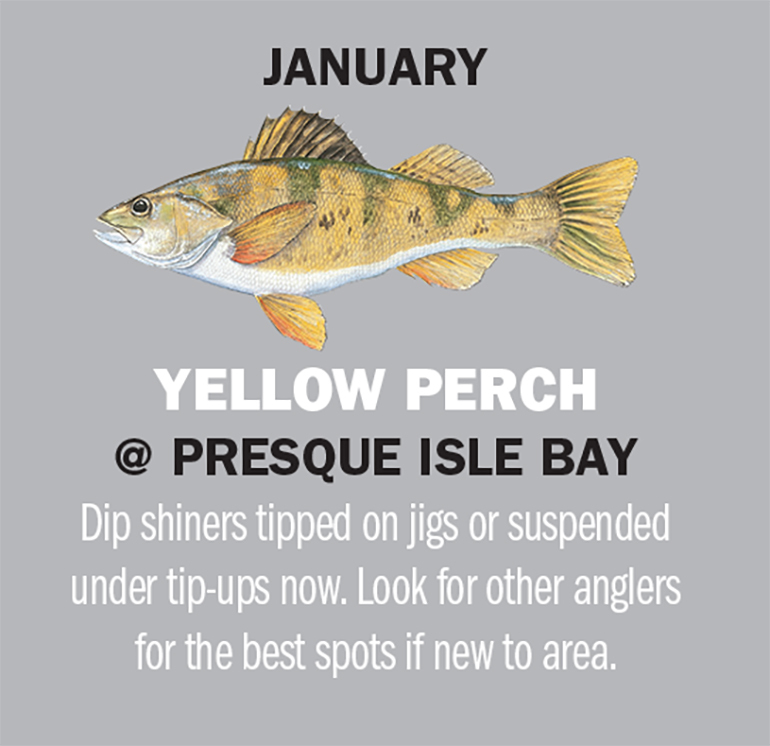 Yellow perch can fire up angler enthusiasm, even on a cold January day on the frozen surface of Lake Erie’s Presque Isle Bay, a 3,000-plus acre basin circled nearly entirely by a peninsula of the same name. The draw of Presque Isle Bay is the average size of the fish, ones that often truly can be classified as jumbos. When the perch bite is on, it won’t be difficult to locate a good area to fish, as anglers will be scattered across the productive zones of the large basin. Shiners, tipped on a jig or suspended under a tip-up, are tops. Local baits shops should be able to fulfill your minnow needs. OTHER OPTIONS Also, consider drifting a jig-n-minnow through pools on the Lower Allegheny River; or jigging through a hole in the frozen surface of Hills Creek Lake for panfish. From late fall through early spring, walleyes in impounded sections of major rivers can be found concentrated below dams. This is certainly true of the Susquehanna River south of Harrisburg, where a network of hydroelectric dams blocks the upstream movement of walleyes. Expect to find walleyes in reduced current areas, protected from the main force of the current. Naturally, in a river system this can change from day to day, so savvy anglers pay attention to river levels, and move accordingly to find areas with the “right stuff” for that particular day. Lure and bait choices can be very basic. Lead head jigs from 1/8 to ¼ ounce will fit the bill most days. Chartreuse, lime green, orange, fire tiger and white will cover things nicely. Tip the jig with a minnow in the 2 to 3 inch range. Make short casts, or fish vertically to maintain feel for the light bite of the walleye this time of year. OTHER OPTIONS Tulpehoken Creek below Blue Marsh Lake is a good trout option for February, where all-purpose nymphs often take trout. And if Kinzua Lake has safe ice, it’s a good time to target the lake’s over-sized northern pike with large shiners. The limestoner Spring Creek, in Centre County, can be an awesome place to spend a March day. It supports one of the densest populations of wild brown trout in the state. And due to its limestone nature, it doesn’t freeze, and after heavy spring rains it rapidly recedes to a fishable level. Access to this gem is good. There are numerous pull offs between the Fish and Boat Commission’s Bellefonte hatchery and the town of Bellefonte, for instance. If you’re looking for areas of lighter fishing pressure, consider the “canyon section” between Benner Springs and the Bellefonte hatchery. But there are lots of trout throughout the stream; you don’t need to hike back away from the others unless you so choose. Most of this stream has no tackle restrictions (there is a fly fishing only stretch at the Bellefonte hatchery). Fly anglers score with tiny scud patterns, small nymphs, and, if the water’s up, streamers such as Woolly Buggers. Blue winged olives can bring trout to the surface. Spin anglers score on spinners, spoons and red worms. OTHER OPTIONS If the ice is off Cross Creek Lake, some big largemouth fall to jig-n-pigs at this time. 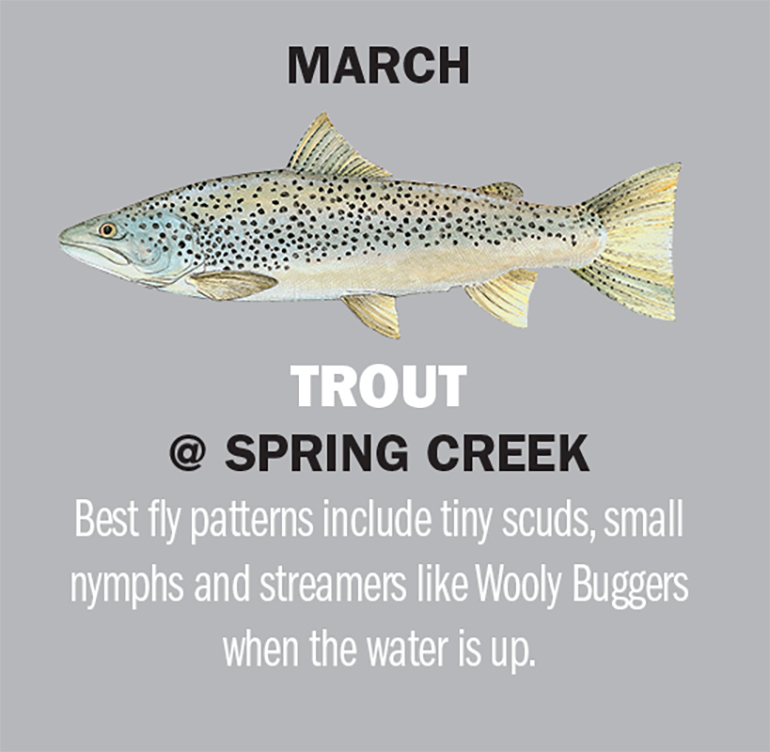 Penn’s Creek trout is another viable March option, where spinners can score. Northwestern Pennsylvania’s Tionesta Creek is a great place to spend the opening weekend of trout season. The main stem of the creek is easily accessed by Route 666. It’s heavily stocked by the Fish and Boat Commission. And if wet weather has the big stream running high and muddy, you can find clear water in one of the many tributaries that feed it, ones such as Salmon Creek and Blue Jay Creek. 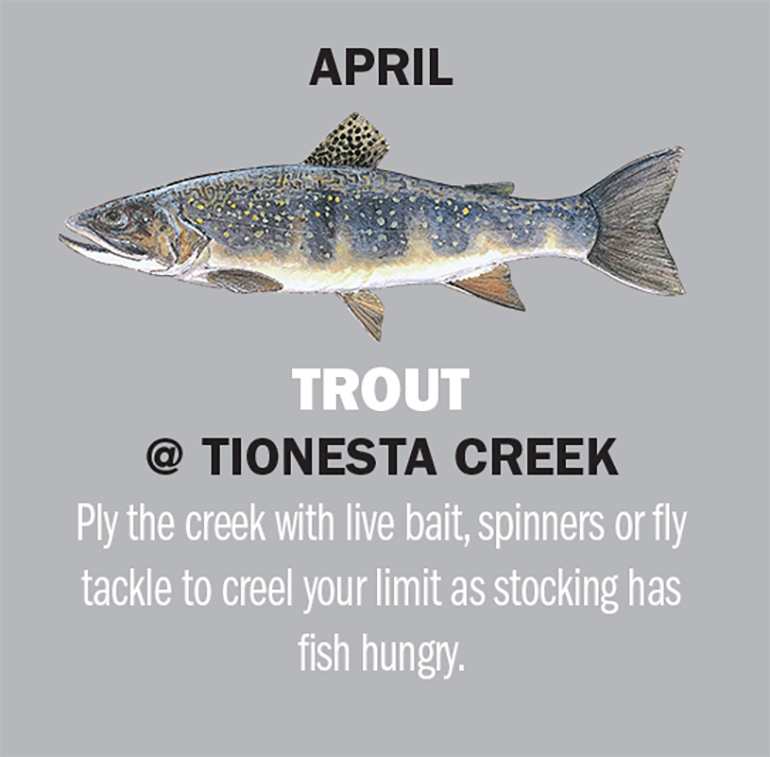 There are no special regulations on the main stem of Tionesta Creek, so feel free to ply it with live bait, spinners, or fly tackle, and to creel your limit of fish if you so desire. The stream typically warms during the summer, making any carry over of stocked trout unlikely. It’s good trout water down to the Kelletville area. This is a big stream where chest waders are often necessary this time of year. OTHER OPTIONS If crappies are more to your liking, fish should be moving into the shallows on Shenango River Lake. Search for them with a small Roadrunner underspin jig. On the eastern border, anglers are catching American shad on classic shad darts. Huntingdon County’s Raystown Lake features a good population of both largemouth and smallmouth bass. May, when the fish have moved shallow to prepare to spawn, is a great time for excellent bass action. Expect much of the action to take place in the coves, in water up to 10 feet deep. But don’t discount main lake shorelines, either, as rocky areas can be attractive to bass, smallmouth in particular. Weightless Senkos and flukes will be good offerings in these areas. If it’s necessary to drop down to the bottom, consider a tube jig in the three to four inch range. OTHER OPTIONS Blue Marsh Lake’s crappies will be heading toward shoreline wood, where a float and jig will dupe them. Now’s also a good time to key in on Beltzville Lake striped bass where minnow baits like a Bomber Suspending Long A can take fish. In recent years some of Pymatuning’s best daytime walleye fishing has been during early summer. ‘Eyes have started to break away from their nighttime feeding forays, making the daytime bite better. Spend some time targeting the edges of humps that top off in the five foot range. Walleyes are often staged along the edges of such structures, which are quite common in the lower half of the lake. Spinner rigs tipped with crawlers are a good way of catching these fish. Slow troll them behind bottom bouncer sinkers. If the shallow bite isn’t happening, work out over deeper water. It’s not uncommon to catch walleyes suspended over 20 to 25 feet of water. Trolled crankbaits including Hot n Tots, Flicker Shads, Shad Raps and Wally Divers produce. OTHER OPTIONS Looking for lots of largemouth bass? Try Kahle Lake, where its common to catch dozens on a June day simply casting a Senko around the weeds. Up on Cedar Run, trout are rising to Light Cahills and sulphurs. The good old days of Lake Erie walleye fishing are back. If last year’s action is any indication, anglers are in for another banner year on the big lake. 2015 witnessed one of the best walleye hatches in many years, so combined with the production from other years, millions of walleyes are available to anglers. Trolling tactics that employ spoons, fished behind Dipsey Divers, are a top method for ’eyes off Pennsylvania’s coast. Last season, walleye schools were so dense that anglers were catching them by casting weight forward spinners, typically a tactic reserved for the shallow western basin off of Ohio. OTHER OPTIONS Lake Arthur’s bluegills should be active this month. Try a slip bobber over a finesse jig-n-grub, fished in slightly deeper water than in the spring. Over on Marsh Creek Lake, try deep diving crankbaits to target bass holding on channel edges. When the dog days of August set in, and bass fishing tends to stagnate on inland lakes, the action often remains hot and heavy on free-flowing rivers like the middle Allegheny. Good smallmouth habitat runs from the Warren area the entire way down to East Brady. Typically, the water is low, warm and clear at this time of year. Smallmouth bass will respond well to moving baits such as flukes and Rapala X-Raps. Swimming plastic Galidas Grubz also works well at times. Dress the grub on a 1/8 or 3/16 ounce jig head and swim it along just fast enough to keep it from snagging. Most of the bass will be in shallow water, often at the heads and tails of pools, or along protected pockets next to riffles. OTHER OPTIONS Over-sized bluegills and ’seeds stack up on Conneaut Lake’s deep, hard bottom ridges come late summer. Catch them on drop shot rigs tipped with finesse-sized grubs or minnows. 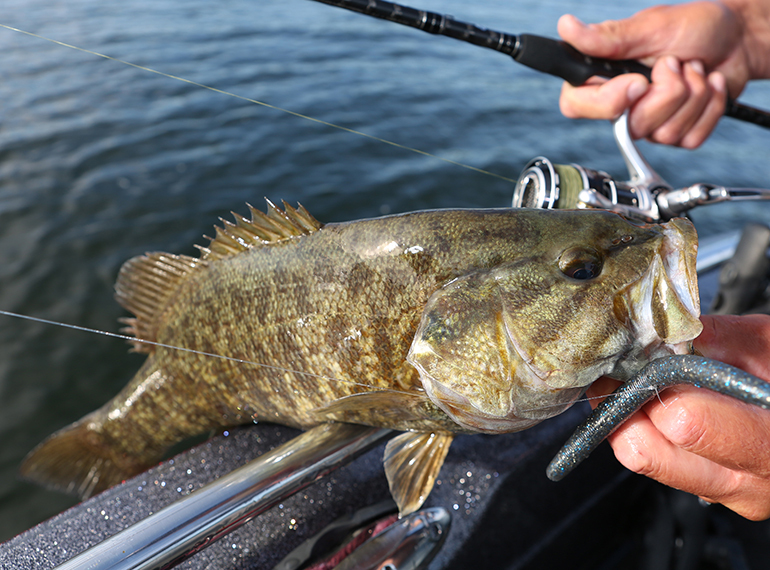 Up on Lake Erie, toad-sized smallmouth bass can be taken in 25 to 35 feet of water on drop shot gobies and tube jigs. The cooling water temperatures of September often revitalizes the action on quality bass waters like Nockamixon, found in the southeastern part of the state. This is also a time when bass start to “look up” more when feeding, as they take advantage of a shift in baitfish location to the shallows. Be sure to include some noisy topwater options like a buzzbait or Whopper Plopper in your bag of tricks. If the topwater bite isn’t on, try dragging a drop shot rig dressed with a Jackall Cross Tail Shad along Nockamixon’s drop offs and channel ledges. OTHER OPTIONS Glendale Lake flies under the radar for muskies, but some nice ones are caught this month trolling big crankbaits. One doesn’t typically associate the mountainous region of Northcentral Pennsylvania with musky fishing, but they’d be missing out on a newly emerging, but quality musky venue. Cowanesque Lake, a flood control impoundment on a river of the same name, has a good population of tiger muskies, and the fishery appears to be on the upswing, as more and more anglers are contacting fish. During a 2017 Fish and Boat Commission survey targeting crappies, significant numbers of tiger muskies were also collected in trap nets, fish up t 44 inches in length. Now is a good time to troll crankbaits within Cowanesque’s basin. Lures that mimic alewife or crappies, both common in the lake, are likely to produce. OTHER OPTIONS Typically, nighttime feeders, Lower Susquehanna River flatheads bite well during the day at this time of year. Use live bluegills. This is prime time for Wallenpaupack largemouth bass. An aggressively-fished X-Rap can call in fish from a distance in this clear lake. Late fall is a top period of the year for river smallmouth bass, and the North Branch of the Susquehanna is a top place to cash in on the fun. In Pennsylvania, the North Branch flows from the New York border all the way to its merger with the West Branch near Sunbury. Good bass habitat can be found all along the way. In November’s cold water temperatures focus your efforts in and around slower, deeper spots, ones protected from the brunt of the current, but with slight flow still present. Bottom oriented baits like tube jigs, hair jigs, grubs fished on leadhead jigs, and skirted jigs like the Bitsy Bug all can excel. Suspending jerkbaits also trigger a lot of bass when they are in the mood. Use hard jerkbaits in the four-inch range, ones like the Husky Jerk, fished ever so slowly with lengthy pauses. OTHER OPTIONs: The leaves should be flushed out of Lake Erie tributaries by now, a great time to drift an egg pattern for steelhead. Now is a great time to key in on Pymatuing walleyes by fishing a blade bait around schools of shad suspended in the lower portion of the lake. The Youghiogheny River, starting at the tailrace of Yough River Lake, provides a good, wintertime trout option. The tailrace area is stocked with adult trout. Below the town of Confluence, the fishery is maintained by the stocking of fingerling stage trout (which carry over and function much like wild trout), as well as stockings from private clubs. Yough River trout can be duped with the standard fare of spinning presentations including live bait and Power Bait-type offerings, as well as hardware. Small suspending jerkbaits like size 6 or 8 X-Raps, and small YoZuri Pins Minnows should not be overlooked, also. 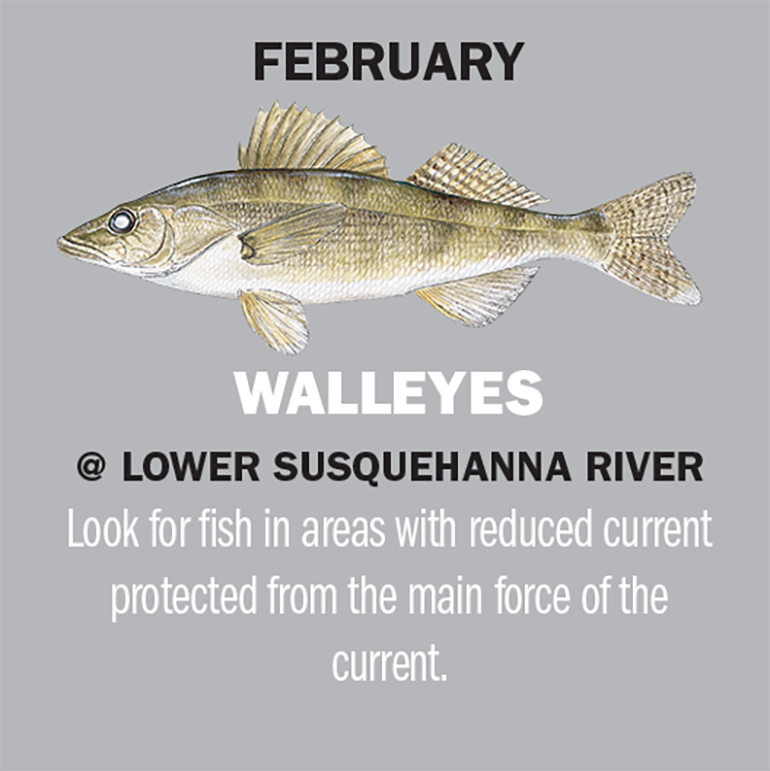 OTHER OPTIONS The Delaware River, around Sandts Eddy, is a good bet for walleye this month. Fish a jig-n-minnow. If there’s safe ice on Rose Valley Lake, try jigging a spoon tipped with a maggot for the lake’s nice bluegills.